Trying to save for holidays is impossible when there is online shopping. Everyday there is a new item of clothing or a new makeup product that I want to try haha!! DressLink is an affordable fashion website which means I do not feel as bad buying as much as I normally do!! 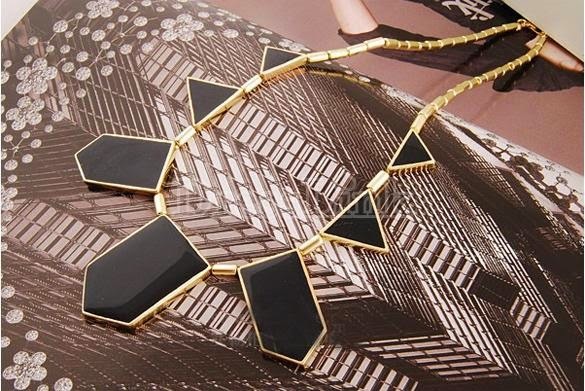 I love this black geometric necklace, I think it would look great casually with a plain white or striped t-shirt with ripped jeans. I think this is a great minimalistic piece to have. This necklace is only $2.11 and currently has free shipping. This striped batwing top would look lovely with the necklace. I love how this model is styled and I will definitely be recreating this look in summer. This top retails for just $6.45 which I think is great as I have recently bought a similar one from ZARA for £25!! I also think this top is soooo cute! I think this top would be great for summer tucked into shorts or highwaisted jeans. However it could be a problem if your out in the sun ahah!! This top is only $2.98. All rights of photographs in this post go to Dress Link.